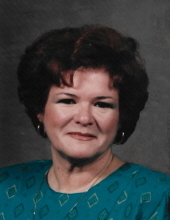 Judith Ann Hodge, age 79, of Perry, OK, passed away February 8, 2019, at Perry Memorial Hospital. Judy was born January 27, 1940 in Chicago, IL, to Milo and Margaret Ridley. Judy met and married the love of her life, Eddie, in 1960, while he was stationed in the Army in Chicago. The two moved to Germany and then finally back to Perry in 1962. Judy worked at Perry Memorial Hospital while attending and finally graduating from the Nursing program at Northern Oklahoma College. Judy retired from PMH as Surgery Supervisor. She is survived by her husband; son Brett (Lisa) Hodge; daughter Dawn Rae (Bill) Ware; daughter in-law Deirdre Hodge; brother Gary (Eula) Ridley; 12 grandchildren and 20 great grandchildren. Judy was preceded in death by her parents; brother, Tommy Ridley; son, Randall Kerry Hodge. To send flowers or a remembrance gift to the family of Judith Ann Hodge, please visit our Tribute Store. "Email Address" would like to share the life celebration of Judith Ann Hodge. Click on the "link" to go to share a favorite memory or leave a condolence message for the family.